State lawmakers put the spotlight on Metra Wednesday over missing a deadline to accept contactless credit cards at pay stations and implement a universal fare card. A 2011 law mandates Metra, Pace and the CTA to create a universal fare card to be used between all three agencies and requires Metra to allow contactless credit cards for payment by 2015. Pace and the CTA in 2014 switched over to a joint fare system dubbed Ventra. Metra said it’s fulfilling that requirement by developing a smartphone app that lets passengers buy tickets on the train and display them to conductors. That feature will debut later this year. The app will allow Metra riders to purchase and display tickets on their screens. It also will serve as a virtual Ventra card for CTA and Pace customers to access trains and buses, probably in 2016. 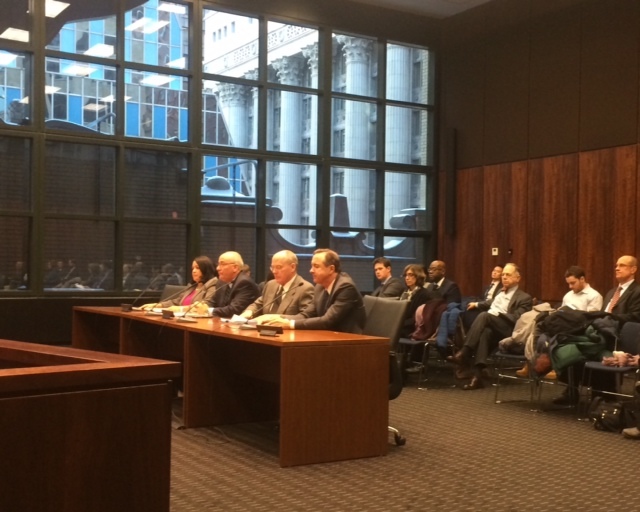 Lawmakers during a Mass Transit Committee hearing Wednesday weren’t entirely impressed. “If you keep going at the pace you’re going … pretty soon you’ll be able to do everything they do in the private sector,” Republican state Rep. David Harris of Arlington Heights said. Democrat state Rep. Al Riley of Chicago noted that some of the delays occurred because of turmoil at the agency and past friction with the CTA under previous administrations. Orseno said the agency will miss its deadline to install contactless credit card readers at ticket counters because the vendor is late delivering cords for the devices. “When did you find out about this?” Democrat State Rep. Fred Crespo of Hoffman Estates asked. Metra learned of the lag several months ago, Orseno said, and “we’ve been trying to get this done for a long time.” He noted that Metra’s order took a back seat to bigger customers. riders to wave their card over a cardreader to pay fares. This fall Metra introduced a sweeping proposal to raise tickets and passes by an average of 68 percent over 10 years. To start off the program, Metra will institute an average 10.8 percent fare spike Feb. 1. The increase will pay for new locomotives and train cars plus cost-of-living operating expenses. Harris noted it’s “a significant fare increase,” which would cause commuters to wonder what immediate benefits they’ll receive, such as the long-desired Wi-Fi on trains. “Will that be in the offing any time in the future?” Harris asked. A first attempt at Wi-Fi faltered when costs were forecast at a prohibitive $72 million, Orseno said. The agency went back to the drawing board and hopes in a couple of months to ask telecommunications companies for proposals for installing Wi-Fi for free. “If it doesn’t work, it doesn’t work,” Orseno said, adding the agency wants to offer Wi-Fi but having 487 miles of track on its routes make coverage difficult. “I understand you want to do it right … I encourage you to be as aggressive and creative as you can,” Harris said.